See that beautiful meal up there? You can save 1,273 calories if you just don’t eat any of it. 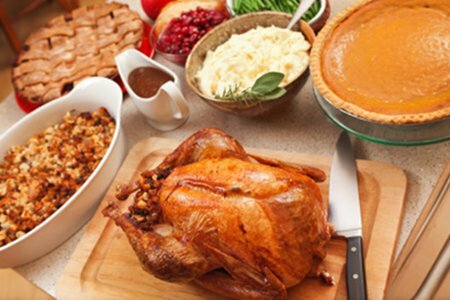 The Calorie Control Council says that the average American will consume 4,500 calories on Thanksgiving Day alone. Tara Parker Pope of the New York Times challenges that assumption in her article - What is the average number of calories a person consumes at Thanksgiving dinner? She figures you get nauseous at around 1,500 so most of us stop before that. The inspiration for today came from Eating Well’s website where they posted a Thanksgiving Recipe Makeover that advertised the 1,273 calorie reduction. Lemon juice instead of butter in the gravy. Creamed onions with low-fat milk instead of cream. Egg whites instead of marshmallows for the sweet potato casserole. Ummm, I hope the miso paste isn’t sold out at my local Stop & Shop!! Or maybe I would rather just say YUCK! You know what, I love you guys. I am grateful for your readership, comments, and stories. I want you to become healthier and feel great. BUT, there are limits to what I will promote to help you achieve your goals. Thanksgiving, tomorrow, is a feast. You are to eat and drink sumptuously and enjoy your family and friends. This is not the time to worry about getting into your skinny jeans or how many sticks of butter are in the stuffing. Enjoy yourself, it’s later than you think. Soak up all love that went into cooking your meal and be grateful. Do you worry on Thanksgiving about your waistline? Please share. Yes. Give thanks, Enjoy all the goodies, & kiss the cook...keep in mind, small portions so you can taste all that's offered...and seconds are compliments to the chef! Thank you, Lisa, for this wise and grounding post. Reminds me not to hold back on the love I pour into the meal prep! I ordered 3 jars of the PB2 ! So easy, & tasty too! It travels well also! Thank you for showing it! The peanut sauce is next recipe to try, dipping brocoli into it! Now, I completely agree with you about Thanksgiving. Counting calories on a Holiday? Lame. But how dare you defame the delicious name of miso?! For the sick vegetarians out there, miso soup is the best alternative to chicken noodle around, and it's a key ingredient in lots of sauces. It's salty and delicious! I never stop worrying about my waistline, but on days like Thanksgiving, I ENJOY my food, try not to stuff myself until I feel sick, and have no regrets. This post is so refreshing after seeing weeks of "how to diet on Thanksgiving" stuff all over the 'net. Lighter stuffing? Defatted pumpkin pie? Cashew gravy? Not for me. Bring on the real stuff and let's get back to business on Friday. Happy Thanksgiving! Great post!! Thanks for keeping it real!! Have a great Thanksgiving! I agree. Especially when you are cooking for other people who may not share your diet restrictions. I will make all my old recipes without changing them to a lighter version and I will just not stuff myself, but will have a little bit of everything (with my wine). Happy Thanksgiving to all. I am thankful for Snack Girl and all her wisdom... I hope to utilize a little self control, but in general the advice to just enjoy and be thankful is the most important part of the day! Your philosophy on Turkey day is so SANE! We do not have a weight problem in our country because of Thanksgiving Day or Christmas. It is my every day routine that I need to make the changes! Thanks Lisa for this post. I just lost my father at the beginning of November, we always had a big gathering for Thanksgiving and this will be the first year he will be gone. Thank you for reminding people that its the celebration that matters, not the calories. Worry about those in January! Lisa, thank you for all of the information you share with us through out the year. Wishing you and your family and wonderful, happy, and healthy holiday season. P.S. - I'll be eating like a woman going to electric chair tomorrow! Friday I'll be crying on the scale, but it'll be sooo worth it! Thank you for a shot of sanity at the beginning of this insane season. Eat what you want, then go toss a football with the kids or enjoy the fall colors of your neighborhood. Seek balance in all things. THANK YOU! I swear you read my mind. It irritates me reading about 'healthier' thankgiving meals. Sometimes you have to forget about the calories and fat or it consumes you. I'm thankful people are eating a home cooked meal instead of fast food. To me that's something to celebrate! I totally agree with you Lisa! I rarely feel food guilt at all anymore, so I'm certainly not going to feel any tomorrow! Great post! Whew! I was worried for a second when I was reading through the suggestions. I shall enjoy my feast in moderation and live on! Thanks for keeping it real! You lost me at the lemon juice! Have a wonderful Thanksgiving. Lisa, have a wonderful Thanksgiving! Just finished teaching my 32yr old son alot of family favorites...best of all he did all the work! Pies, pumpkin, apple/berry, brining the bird, stuffing dates, prepping garnishes, etc. Oh we're gonna enjoy it all [in moderation]!! He had to nap, :) and there's so much more to do tomorrow. We are all so blessed all year. Enjoy! Yes, a person has to eat responsibly if he or she wants a healthy body -- BUT -- and this is a BIG BUT -- there is more to life than just a regimen. Special occasions are for enjoying good food in the company of those you care for. You can worry about fat grams and sodium and the size of your rear end on an ordinary workday. You had me for a minute! I've made the personal decision that many of my childhood memories are of not just the food, but the love that went into its preparation. I will enjoy all of my favorites this holiday season in moderation and will stay active which, fortunately, is also a family tradition. Happy holidays to all. Have a great Thanksgiving Lisa. Such a breath of fresh air to read your post. I worry all the time about what I eat, as you age it doesn't matter, the mid section expands. But I will enjoy tomorrow and keep exercising and watching carefully what I eat. I've made a few healthier switches in my menu and I HOPE I don't stuff myself like I use to, but I agree it's about family and enjoying time together, not obsessing about calories. Happy Thanksgiving Lisa! I'm thankful for all the information you share with us. I think that twice a year, Thanksgiving and Christmas, we should be thankful for these family gatherings, & not worry about all the butter on the mashed potatoes, the gravy, the stuffing, etc. Twice a year, enjoy this delicious food with the people you love. The rest of the year, be conscientious of what you eat, portions, etc. Happy Holidays! !